I had a great weekend in Milwaukee! Nick Rosencutter and his staff were so welcoming. The last time I was in Wisconsin, Nick helped me reinforce the concepts of autonomics as he did the “Ice Bucket Challenge” in a proper Left Stance position of AFIR. He managed to find the video to show this class. Super fun to meet new people and then reconnect at PRI courses! We once again had a diverse group of clinicians from PT’s, ATC’s, and Strength and Conditioning specialists. The course attendees were mostly new to the science of PRI and taking their first PRI course. Myokinematics is a great first course for clinicians to introduce PRI concepts. I enjoyed integrated discussions about respiration and gait as it relates to an A on F vs. FA activity. 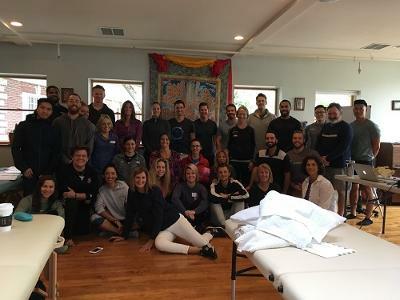 I spent Sunday a.m. teaching both the HADLT and HABLT and tying together Saturday’s passive positional tests to help these new clinicians begin their PRI clinical journeys. It is so great to have so many new clinicians and wellness professionals interested in learning PRI. Overall I am proud of my course attendees for opening their minds and practices to the science of PRI! 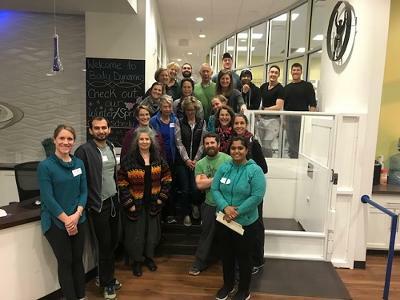 I had a great time this weekend teaching Myokinematics of the Hip and Pelvis at Body Dynamics in Falls Church, VA. 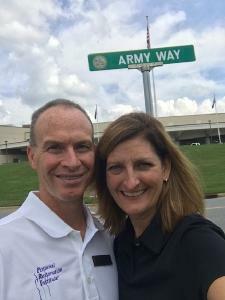 I grew up not far from Falls Church and my college roommate lives in Rockville MD. I got to spend some time with an old friend and teach a course that I consider an old friend. Myokin is a great course to start a PRI journey and that is exactly what 90% of my course attendees were experiencing. We took an OBER and Thomas Test and turned them from orthopedic soft tissue tests to the neuro respiratory positional tests as they provide clinical evidence of an asymmetrical pattern. There was as much fog in the room at 4:00pm on Saturday as there was on my drive up to VA on Friday night! But… by Sunday at 5pm the sun was out and the connections in their new PRI minds were clear as the weather outside! PRI is an integrated science and Myokin of the hip and pelvis is just one piece of an integrated system. But what would a Diaphragm be without a solid pelvic base and a good appreciation of AFIR in stance and AFER in swing! I was honored to have Dr. Felix Liao, DDS author of “6 foot Tiger in a 3-foot cage”! Dr. Liao considers himself an airway mouth dentist. 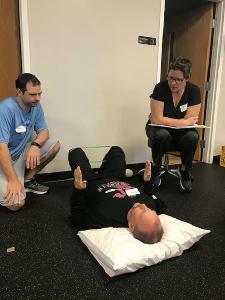 He was in attendance to understand the perspective of the PRI therapist, so he can better understand the neuro mechanics of PRI and how he can better help patients integrate! Jennifer Gamboa, Lisa Clarkson and the entire staff of Body Dynamics welcomed all of us to their clinic. These professionals all work well together and it was so fun to watch how they picked right up on PRI methods. Lisa had been exposed to PRI out in Seattle as a student. She did a great job hosting us this weekend! This class kept me on my toes and asked awesome questions to better understands how to integrate PRI into the current practice. I always enjoy teach Myokinematics of the Hip and Pelvis. It helps further stabilize my own clinical practice and reinforce the importance of sound PRI fundamentals in my treatment plan. I liken teaching Myokinematics of the Hip and Pelvis to putting on a comfy pair of slippers. I took my first Myokin course back in 2001 the first time Ron offered this material. The course has evolved over time as the Institute learns more about our normal balanced asymmetry and how we compensate in three planes. Despite our deeper understanding of how the visual, occlusal position and proper shoes affect compensation patterns, clinicians still need to understand the fundamentals of a Left AIC pattern as it relates to position and performance. An F (femur) moves on an A(acetabulum), yes, but an A also can move and stabilize an F. This is the foundation of this course. We then need to fully understand how our patients compensate for this normal pattern. Did they or did they not over lengthen their anterior hip ligaments? For me, this is the question of the 2 day course! In Worcester Mass this weekend, I had an amazing group of clinicians. A large number were taking their first official PRI class. So Fun! But, all of them knew of PRI or were working along side a co-worker using PRI in their practice. They were all in Worcester to learn for themselves how to help their patients/ athletes. Once we were all clear on the pattern and the position of AF whether it be in IR or ER, we learned the tests to determine their positions and compensations. On Sunday afternoon, we just problem solved our way through the treatment progressions. The class was focused on utilizing functional tests and muscle algorithms to guide what came next. For years I used an analogy in my teaching that seeing a patient present in the clinic as a L AIC was like seeing Yellow VW bugs driving past you on the road. But it is a new day and time for a new analogy, that I now refer to as "Mustang Sally". We had some fun after lunch taking our group shot with my Mustang rental car that I've been upgraded to, 2 weekends in a row! New car for my husband Chris, I think maybe! Since then, I see Mustang's everywhere I go, now that I am looking for them! Hats off to the staff of Central Mass Physical Therapy! This is the third time I have taught at this host site. I was able to meet some new staff, make some new friends and see some familiar faces. Damion Perry, Yolanda Pappas, Borbala Suranyi and Gene Lyons were all in my Pelvis Class last month in Boston. Meredith Stephens, MS, PT is also a faculty member for Anatomy Trains. We had some great gait discussions at lunch. I look forward to learning more from her in the future. Maureen Watkins, PT is faculty at Northeastern University in the PT department. Her non-patho hip helped me demonstrate how to develop hole control on the right side with a glut max and obturator in the transverse plane. I always enjoy teaching Myokinematics. That's a wrap for 2018. I will look forward to teaching this awesome course next year! 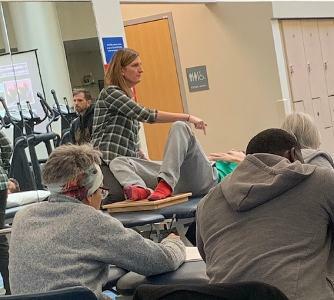 I enjoyed teaching Myokinematics of the Hip and Pelvis last weekend in Asheville, NC! This was a special weekend as I was able to take Mr. Jen Poulin aka Chris with me to help! It has been awhile since we were able to travel and teach together. We were joined by Josh Owen, ATC, PRT. It was great to meet Josh and have him help with the labs. 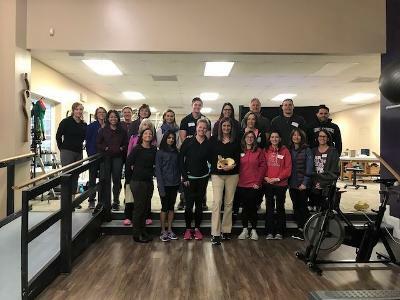 This course was hosted by the fun energetic group of clinicians from the Charles George VA Hospital. Tammy, Doug, Amy, Monica to name just a few of the staff, made us feel welcome. Most of the class were taking their first PRI course! I always enjoy this class as it really hits home the fundamental concepts of AF and FA position and common compensations. We all appreciate the importance of respiration as it relates to stabilization of a pattern. 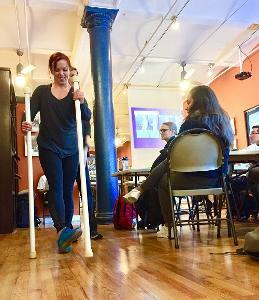 This course really helps the course participant understand how respiration and gait are so interconnected. Concepts of swing vs. stance, AFIR, AFER and soft tissue compensations were understood as it relates to position, pattern and performance. I had so much fun teaching this past weekend! I can't wait to come back! I will get a few weeks off and look forward to heading up to Worcester, Mass on Oct. 13-14th to teach this awesome course again! Thanks for everyone's prayers for NC. Hurricane Florence left her mark, but we are Carolina Strong! I had a great time last weekend teaching Pelvis Restoration in Newton, MA. I had not taught a class since last year! It was great being able to spend more time with my daughter Madison before we sent her off to college. Yes, the rumors are all true, she is a Freshman at the University of Vermont! My alma mater! I guess you can take the girl out of VT, but she can always go back! So now it was time for me to get back to #PRINation and share my "pearls" of PRI wisdom. 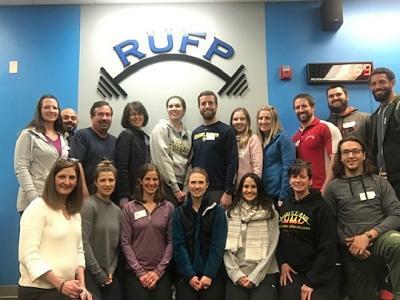 The class was a nice mix of new clinicians to PRI and some that were looking to refine their PRI interventions and concepts. Pelvis Restoration is one of the three intro courses that allows a more integrated discussion of respiration as it relates to the Pelvis and frontal plane control. This course is so much fun to teach! Pelvis allows the clinician to explore how a "Laga Gaga" Born this Way chain can cause our "inner Beyonce" to come out as we learn to stabilize left stance. Thanks so much to Donna Behr for being an amazing host and Anita Furbush, PRC for coming to help me during lab. Since then, I have been busy getting ready for the impending Hurricane. Please pray for the Carolinas as we prepare for Hurricane Florence to hit our sweet states. It was a beautiful fall weekend in the suburbs of Philly! I was welcomed back to Premier Orthopedics to teach the newly revised Pelvis Restoration this past weekend. I had taught the Myokinematics course at this location 2 years ago. It is always great to return to a host site and see some familiar faces in the group. Thank-you Justine deLuccio, PT for sharing your patient successes and passion for PRI with me and the group. It is always refreshing to help guide clinicians on their PRI journey. I was joined by my able Lab Assistant Miguel Aragoncillo, PRT and thanks Jon Herting and Jon May for being repeat course participants of my classes. It feels good to build these friendships across the country and share the science of PRI. Pelvis Restoration is a great first course for new clinicians to take. Understanding the influences of stance and swing as it relates to frontal plane control and respiratory influences of the pelvic and respiratory diaphragms is a great way to enter the science of PRI. I LOVE teaching this course, because I love the depth of information it allows me to share. Thanks to my new NYC friends and their help during demonstrations. Your smiling faces in the group always energize me! Tim Corker did a great job as the host coordinator and I wish him all the best as he integrates PRI into his practice. A very special shout out to Andrea Chellini, PT who came all the way from Florence Italy to take his second PRI course here in the USA. The global reach of PRI never ceases to amaze me. So I think I need to create a new PRI hashtag. It feels good to grow the #PRIWORLD. Here also is a pic of me with the Liberty Bell. Let freedom ring! Proud to be an American!